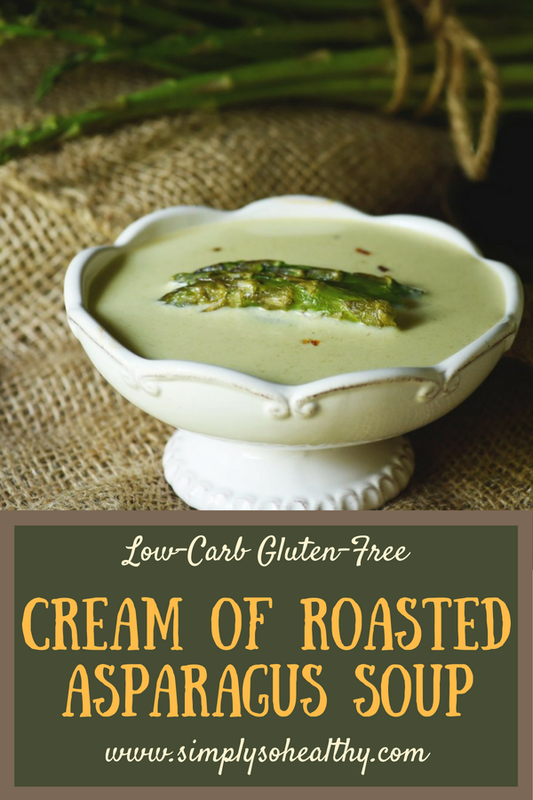 This Low-Carb Cream of Roasted Asparagus Soup recipe makes a flavorful creamy way to welcome spring and early summer. This recipe can be part of a low-carb, keto, diabetic, Atkins, gluten-free, grain-free, or Banting diet. Instructions include an easy photo tutorial. I don’t know if all of you are on Instagram, but last week @hautecuisines were celebrating asparagus. 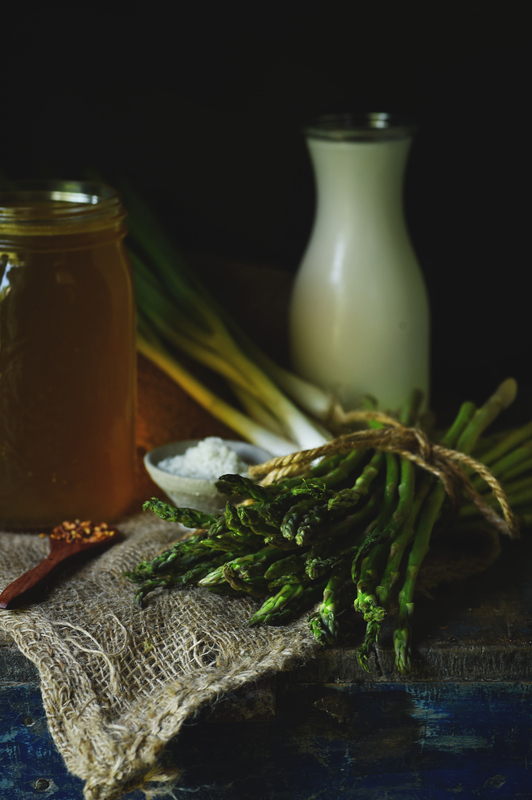 They shared gorgeous photos of fresh cut asparagus, asparagus tarts, and loads of asparagus soup. 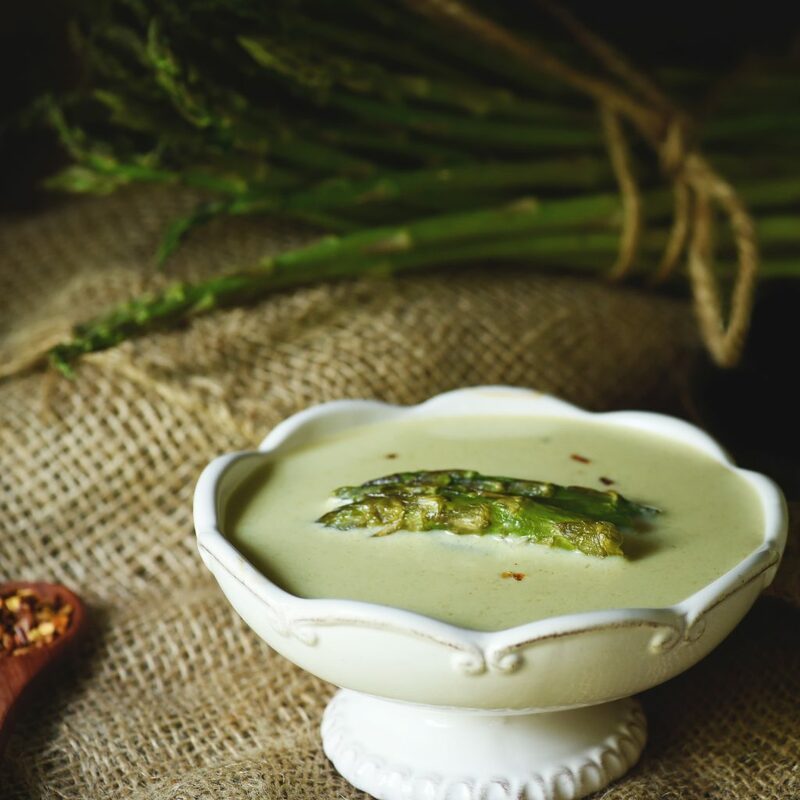 After looking at all of those mouthwatering photos, it made me hungry for–you guessed it–asparagus soup. By the way, if you’re on Instagram and want to be in the know about what’s going on in our kitchen (including some surprise visits from my farm critters and house critters on my Instagram stories), follow us! 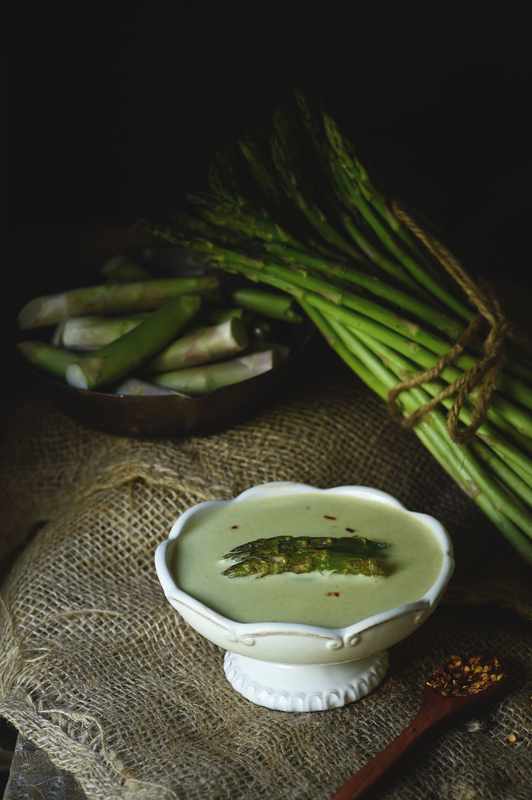 I wanted my recipe for asparagus soup to be something special. Something that set it apart from the massive collection of soups on we see on the internet. I wanted this soup to really shine. In order to make it super special, I decided to combine it with green onions. 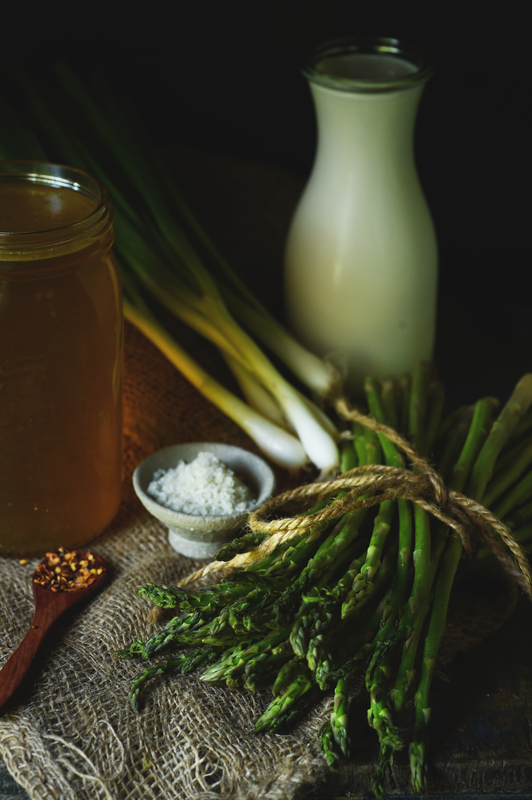 To me, both green onions and asparagus are synonymous with spring. The flavors work together remarkably well. It’s almost like they were meant to be together. I took this marriage of green onions and asparagus and roasted it. Roasting it adds in some caramelized goodness as well as a soft, toasted flavor. Roasting the vegetables makes the kind of soup that will stick in your memory for years to come. Along with the roasted vegetables, I use a bit of garlic, some wine, bone broth, and cream for the soup base. I add in just a hint of red pepper flakes to add interest without making it hot. This soup makes a perfect starter or can be used as a main dish. It would be perfect for a spring or summer brunch. Enjoy! Preheat oven to 375º Fahrenheit. 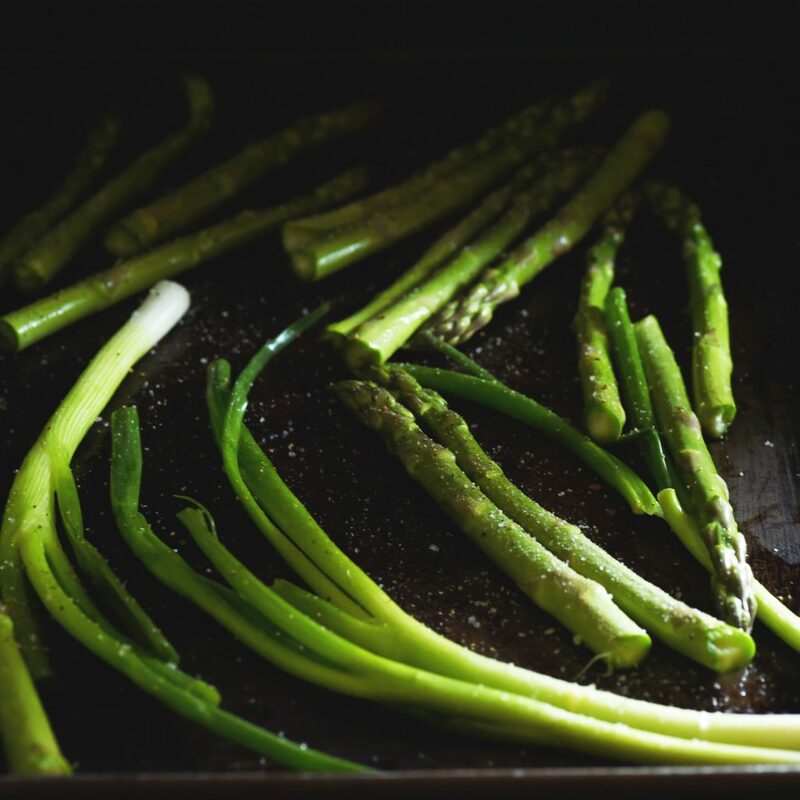 Place asparagus and green onions on a baking sheet. 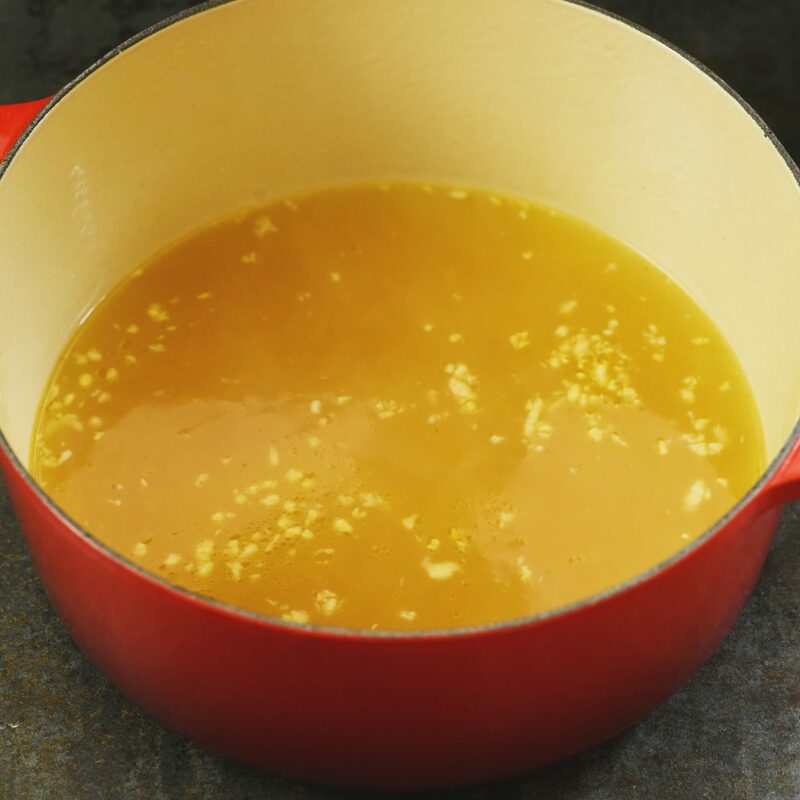 Drizzle melted ghee over top. Rub the ghee or butter all over the vegetables to coat. Sprinkle lightly with sea salt and pepper. Roast asparagus and green onions in the preheated oven for 15 minutes. Remove from the oven, turn the vegetables and roast 5 minutes longer. Remove from the tray and cut into large chunks. Be sure to keep some of the tops set aside to use as garnish later. Meanwhile, heat a heavy medium saucepan or dutch oven over medium high heat. Add butter. 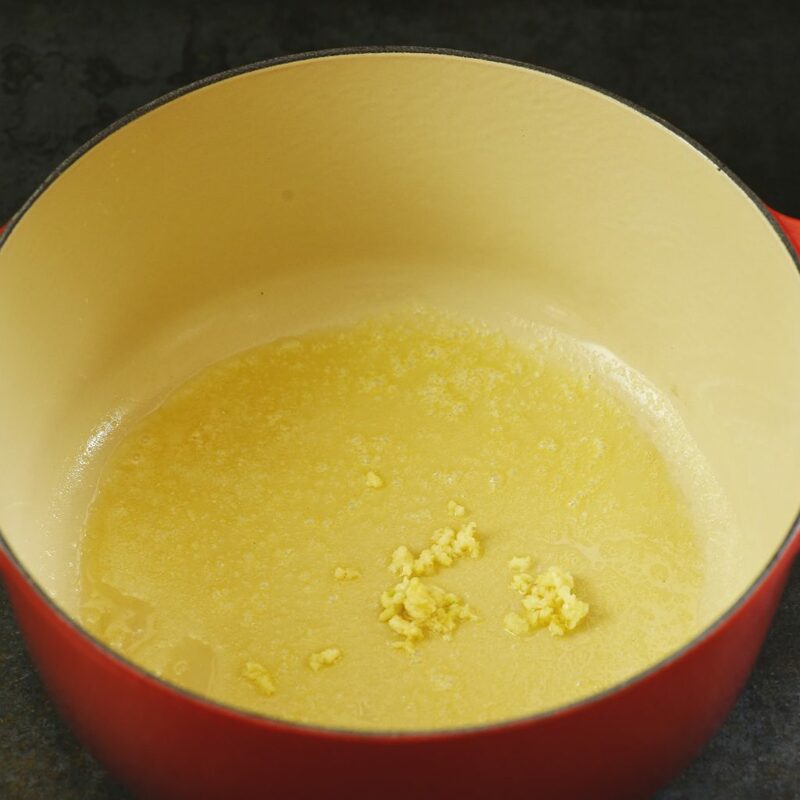 When butter has melted and has stopped foaming, stir in the crushed garlic. Cook garlic, stirring frequently, until fragrant, about 30 seconds to a minute. Stir in the wine. Turn heat to high. Bring wine to a simmer, stirring occasionally to bring up any browned bits on the bottom of the pan. Simmer wine until much of the wine has evaporated and the mixture has thickened slightly. Stir in the broth. Remove from heat. 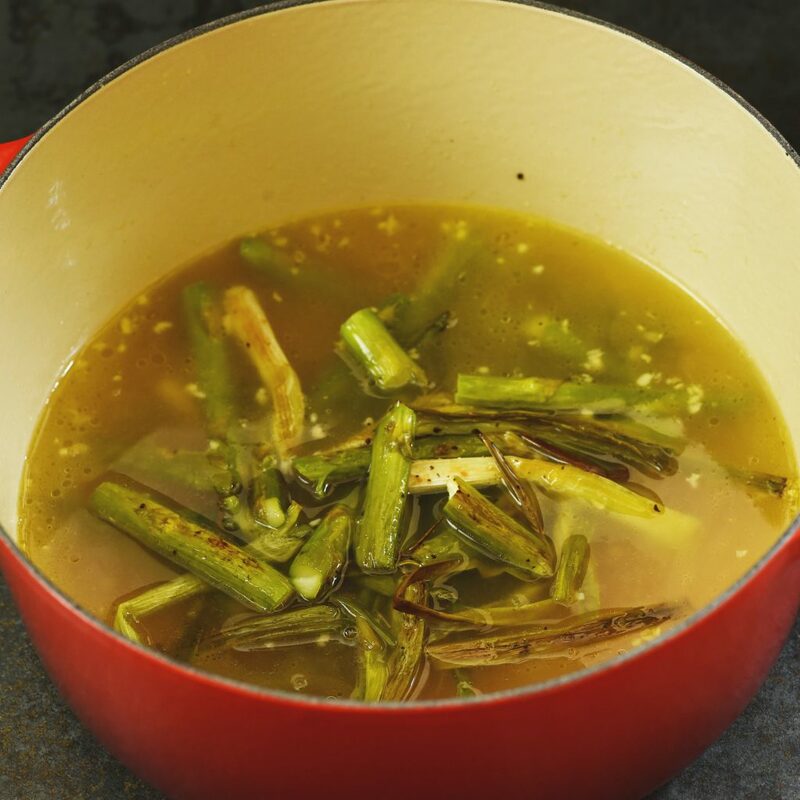 Transfer the roasted asparagus (reserving a few tops for garnish, if desired) and green onions into the broth mixture. Using a blender or an immersion blender, blend soup until liquified. Transfer back to the dutch oven if using a blender. Over medium high heat, bring heat back to a simmer. Stir in cream and red chili flakes. Bring soup back to a simmer. Simmer until thick enough to coat the back of a spoon. Season to taste with sea salt and black pepper. The amount will vary depending on the type of broth used and personal preference. I used an unsalted broth and added in about 1/2 teaspoon sea salt and 1/4 teaspoon black pepper. 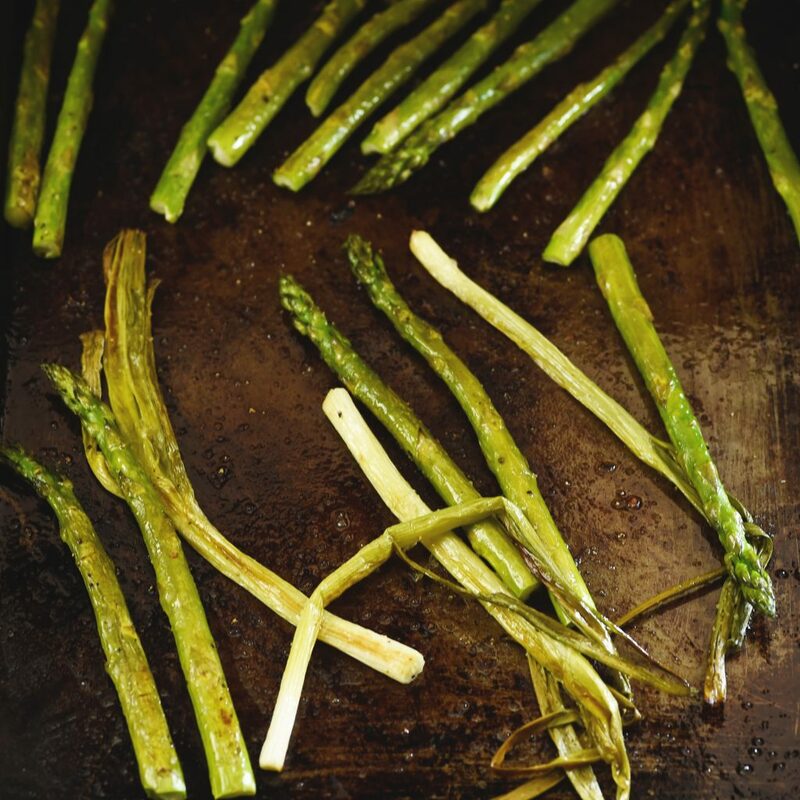 Serve warm, garnished with the reserved asparagus tips. Serving size: 1/4th of the recipe or about 1 1/4 cup. Fabulous! I love cream of asparagus. So subtle and delicious! I love that you roast the asparagus first! That must add such a nice caramelized flavor! Wonderful photos, too! Just lovely! You have beautiful photos! 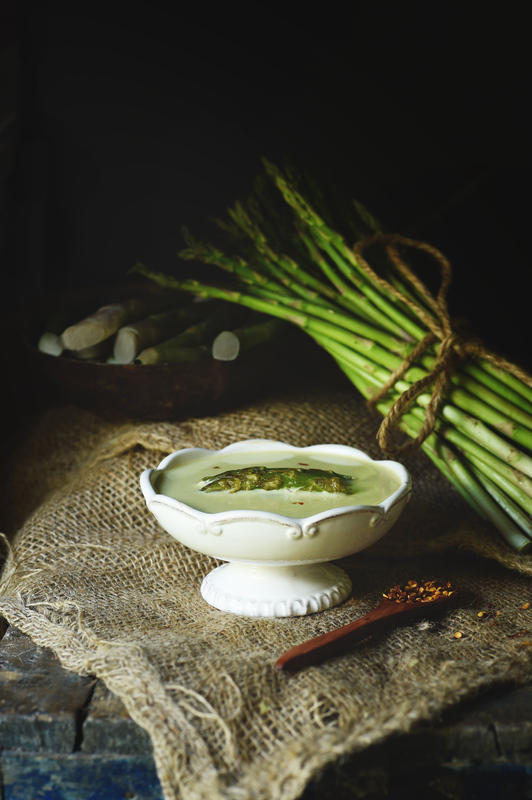 This cream of asparagus soup looks so delicious and comforting! I love how creamy and easy it looks! We love asparagus and are lucky enough to live in a big asparagus growing area here in Northern Italy! This soup sounds divine. I agree roasting vegetables gives them so much more flavour! I roast asparagus a lot but have never made soup with them. def have to try! Best Asparagus soup EVER! The subtle flavors of the garlic and red pepper flakes make it so special! Thank you for sharing! Thanks so much! I like my recipes to be like a fine wine–with lots of complicated flavors. Sorry, but way too much broth. Soup tasted great, but was too runny. My garnish sank to the bottom immediately. I even added about 4 cups of cheese, but still runny. Decrease broth, otherwise wonderful flavor. Glad you loved the flavor. The soup is not a super-thick soup. It’s creamy, but not thick. What is counted as a serving. Serving size is 1/4th of the recipe or about 1 1/4 cup. I havn’t cooked the soup yet but it looks really good. I’m confused that the first ad to pop up on your “low carb” page is for baked beans. Doesn’t seem to fit with your mission. Yes, occasionally I see ads on the site that irritate me as well. I work with a company that does all of the ad sales and much of it is done minute to minute. While I don’t really like having ads on the site, they are what keeps the lights on and what keeps the site alive. If it weren’t for the ads, I would have to shut down the site. I could do more sponsored content, but I prefer to provide everyone with recipes that use ingredients they can find easily. OK. I get it. thanks for the reply.